Brief Synopsis – An actor playing a Shakespearean character on stage for so long starts to take on the personality of his character even in real life. My Take on it – This is a film that I’e been interested in seeing for some time because it shows the role that Robert Donat portrayed which own him an Oscar. The premise of this film is quite interesting and we get to see a story about how life can imitate art sometimes in a very disturbing and unexpected way. We all know that actors are suppose to find a way to get into their character on screen, but it seems even more important for someone appearing on the stage night after night playing the same role. This film shows how that kind of life can perhaps effect an actor who gets too much into his character. Colman is great here and we really feel the way that he transforms himself into his characters depending on what his current role may be and it actually comes across as seeming quite realistic in the way that it is done. The odea to merge the story with an actor getting into his role and making it a film noir mystery at the same time is very intriguing and we get to see something not often done on screen. AS we all know that members of the Academy sometimes favor roles which portrays actors on screen or on stage, it was’t a surprise to see that he won an Oscar for this very complex role. Bottom Line – Great premise that shows how life imitates art sometimes in a very disturbing way. Colman deservingly won an Oscar for Best Actor for this role. He plays his character so well because his personality changes so vastly from role to role which helps him give the audience such a realistic look at how an actor can dive into his roles so well. 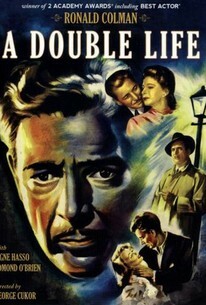 Really liked the way that they merge a film noir story with a tale about the life of an actor. Recommended! Love this movie. Colman was spectacular as the actor losing his mind and not being able to differentiate between the play and real life, between his ex- and the character she played. It was a brilliant idea – and IMO – probably should’ve won the screenplay Oscar (over The Bachelor and the Bobby Soxer) for Ruth Gordon and Garson Kanin.